i couldn’t help but notice recently that one of my favorite small businesses is growing: the citizenry just opened their first retail working studio space, so i thought it might be fun to invite them to share a little behind the scenes peek. 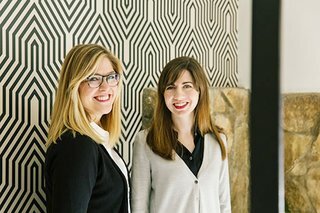 i so admire what founders carly nance and rachel bentley have created — once based from carly’s garage to building a successful, global business with a real soul, i thought a lot of you might like to learn a little bit from them. so many of you readers are entrepreneurs and makers, i think their story will light a little fire for you. the citizenry was inspired by their never-ending sense of wanderlust and a mutual desire to make a positive impact. continually frustrated by the mass-produced products offered at traditional retailers, the duo set out to transform modern home goods with the citizenry. so today, we’ve got some great imagery of their dallas studio photographed by kelsey foster, along with what i think is a very inspiring q&a commentary on the backstory of the citizenry and the beautiful design of their new space. never fear if you’re not in the dallas area — you can you can shop the citizenry online, too. where were you both working elsewhere before leaving to start the citizenry? rachel: i was actually at columbia business school when we started building the citizenry but prior to that i worked in strategy consulting at bain & company. carly: i spent my career as a brand strategist at advertising agencies in chicago, new york, and most recently, dallas. i felt like it was time to put my money where my mouth was and use my skills to build a brand i knew needed to exist in the world. the citizenry is a marriage of all the things i’m inspired by – travel, design, and doing a bit of good in the world. it’s really rewarding to connect with our customers who share those same passions. why did you both decide to start a business together? rachel: as different as we are, i think we always had a deep mutual respect for each other. after college, we were on opposite coasts for a while but had an understanding that if we ever decided to start something, we’d let the other know. while i was at business school, i started exploring business ideas. of course, i reached out to carly who was working in paris. we ended up talking about how uninspiring shopping for home décor in the us had become with so many mass-produced, dime-a-dozen options. she was spending a lot of time shopping the markets there, and we realized the things we loved most in our homes were picked up during our travels. ultimately, we decided to build a company that lets people travel the world and meet these incredible makers through beautiful, modern products for their homes. carly: for me, it was more of a creative need. i loved what i did before the citizenry, but i struggled with the big picture – how was my job making a positive impact on the world? i want to leave this world a little better than i found it and use creativity to solve issues that matter. the citizenry is a step in that direction. rachel: on my end, it was a personal goal. after working in private equity and on consulting projects for consumer goods and retail companies, i knew that i wanted to create a business that leveraged consumer demand to create needed economic opportunities around the world. i wanted to build a company serious about social impact and sustainability. that goal is what keeps me motivated to continue pushing forward. what’s the most rewarding thing about running the citizenry? rachel: i believe what we accomplish with our artisan partners everyday is profoundly important, even though it’s deeply challenging. we are partners with them and are in the trenches solving challenges alongside them. it is so rewarding to see their success as a result of the citizenry, and i want to further that impact. carly: collaborating with the hard-working, brilliant people in our headquarters and some of the most incredible makers around the world. oh, and putting something really beautiful that i’m proud of out into the world. that’s rewarding too. carly: we choose places for our collections based on a brilliant natural resource and a history of craftsmanship and expertise in a certain category. we’re always looking for techniques we haven’t seen before and pieces that can be reimagined in a more modern way. rachel: from there, we choose artisan partners who are the best at what they do. this takes a lot of research and time on the ground. it’s crazy how someone always knows someone or locals can point you to specific techniques in different villages. many of our greatest relationships have been built by traveling off the beaten path. rachel: i still draw inspiration from my experience and mentors at bain. in particular, i always go back to their mentality about making strategic decisions – "do extraordinary research, make a data-driven decision, and then put 100% of your and your team’s efforts into execution." this means don’t waste time revisiting decisions — unless you discover something that invalidates a key assumption. and in startups, time is everything. so many businesses (& leaders) fail because they can’t stick to a strategic decision longer than three weeks, often because they didn’t spend the time developing quality research and strategy at the beginning. we spent well over a year developing the citizenry before we launched, which was absolutely critical to our success so far. carly: a friend who founded a company a few years before us told me to make sure we always "zag" and do as many things differently from the rest of the category as you can. for us, that meant taking a different approach to supply chain by building long-term relationships with our artisan partners, a different approach to retail by going directly to consumers online, and a different approach to design by combining traditional artisan techniques with a modern aesthetic. as you grow, it’s definitely tempting to take the easy route and just do things the way they’ve been done before, but we are challenging ourselves to continue to push boundaries. we’re going to continue to take the road less traveled, quite literally. 1 – changing careers or starting a business is a deeply personal decision. most importantly, i think a new direction must align with your values, intrinsic motivations, personal strengths, and professional experience. 2 – if you’re considering starting your own business, i’d encourage you to think long and hard about what you’re willing to give up (like finances & personal time) to pursue this new path. 1 – do you have a clear, focused idea with a large market opportunity? research, research, research until you do. 2 – are you ready to work harder and longer than you ever have before? 3 – how good are you at juggling many things and starting with a million blank pages? i’m amazed by how many things we have to do in a day, and every task is a learning experience – from designing new types of products to figuring out recruiting and hr policies. rachel: drive. no question about it. drive cultivates talent and creates your luck. carly: honestly, you need a combination of all three, but relentless drive is 70% of the game, 25% talent, 5% luck. rachel: success is dedicating your life to something meaningful. and it’s getting to do that alongside people i love and learn from every day. carly: for me, success is living how and where i want to, and loving what i do. what kind of vibe did you have in mind while designing the new studio space? carly: when we started the company a few years ago, we were working out of a minimal, all-white studio above my garage. it felt like a blank slate, a place that inspired creativity. we wanted to bring the same feeling into our new studio but take it up a notch. overall, we wanted to create an artistic and collaborative feel in the new space. when it came to design, we wanted to be sure that design elements of our products were reflected throughout the space. so, you’ll find traces of our products here and there – copper accents, inspired by our copper butterfly chairs, minimal palette, from the neutral colors of our best-selling textiles. since the citizenry is all about celebrating the best craftsmanship around the world, designing the studio was also the perfect way to incorporate some of our favorite us designers and makers. we worked with stash design to build desks and shelves, brendan ravenhill to make some custom light fixtures, and lostine for some accent pieces. rachel: i think something else that plays a big role in the citizenry studio vibe is how the showroom is combined with our workspace. while you’re browsing the showroom area, you may also overhear a phone conversation with one of our artisan partners or catch a glimpse of new product samples laid out on the tables – whatever it may be, you are definitely getting an inside look at our company. it really is an intimate and unique shopping experience! carly and i love hosting visitors in the space. it’s an extension of our own homes so we let our native southern hospitality shine – we’ll pour a glass of wine and share stories with anyone who comes in. what’s your next destination for discovering new artists? carly & rachel: we are heading to europe for the next collection, which will launch this summer. we’ll be announcing the specific country in a few weeks! carly & rachel: our playlist is always evolving, but some of our mainstays: lord huron, alt-j, the national, james bay, alabama shakes, and leon bridges.